Given the chequered history of Street Fighter on the big screen, fans of the computer game were due another decent shot at the source material. This isn’t quite the movie it wants to be, spoilt by an uneasy balance between urban realism, wire fu and computer-generated fireballs. But focusing on the parallel origin stories of both Chun-Li and M. Bison (two of the game’s most identifiable characters, outside of Ken and Ryu) is a worthy concept, even if the resulting film is mishandled. 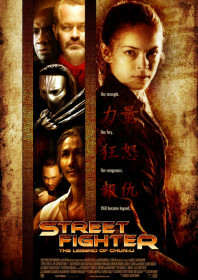 Clean-cut Smallville star Krisitin Kreuk never quite nails Chun-Li’s revenge-driven, murderous side, busily working through her daddy issues by quitting a privileged life as a Hong Kong piano prodigy to hit the slums of Bangkok in a bid to find her missing father. He has been kidnapped and forced to work for aspiring tyrant M. Bison, who plans to bulldoze a Thai shantytown to build his Bisonopolis. Bison is played with an icy, blue-eyed sophistication by Neal McDonough who probably does best with the film’s risible dialogue. The clunkiest device is a completely contrived subplot involving two American Interpol agents – played by Chris Klein and Moon Bloodgood – which seems to have been lifted from a US cop show and planted onto the streets of Thailand. Robin Shou performs a spot of video-game cross-selling by channeling his Liu Kang character from rival franchise film, Mortal Kombat, to play Chun-Li’s mystical teacher, Gen. He adds a fantasy element which feels incongruous, providing Chun-Li with a surrogate father figure while spouting fortune cookie wisdom. The film takes the wise decision of avoiding character overload – unlike the 1994 film – and is somewhat wiser in its references to the game (we don’t even get to see the characters in their signature costumes). Fundamentally, the issue is with the game’s inherent campiness, which just doesn’t translate well into a contemporary action setting. Fans looking for a clearer vision should visit Joey Ansah’s web series.